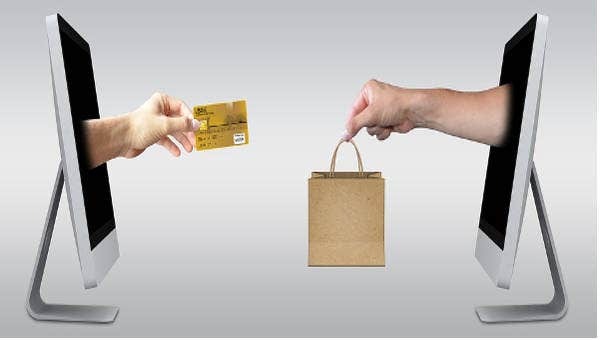 Current employment trends consider the retailing industry as a competitive field. More business entrepreneurs venture into this line of business. If you’re interested with such field, one critical element that you need to take into account is your cover letter. Your cover letter template empowers your resume. 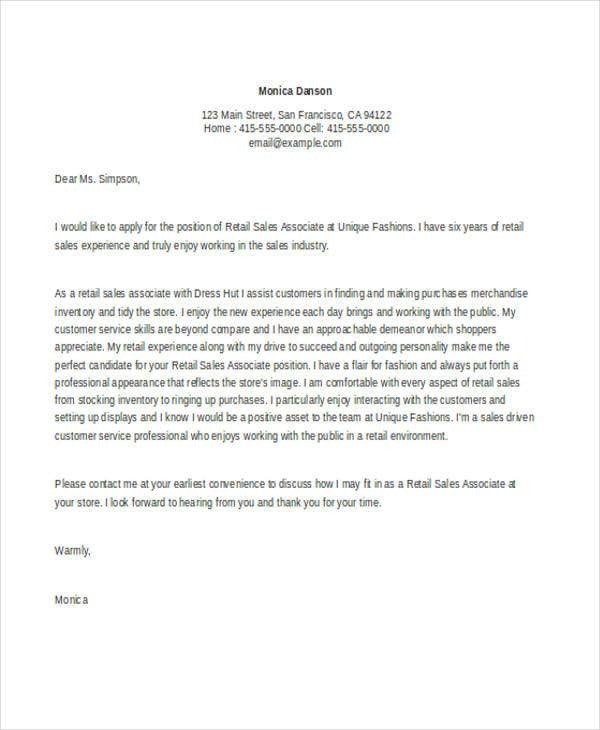 In line with this, on this page are retail cover letter templates that will help you emphasize and highlight your skills and qualifications. 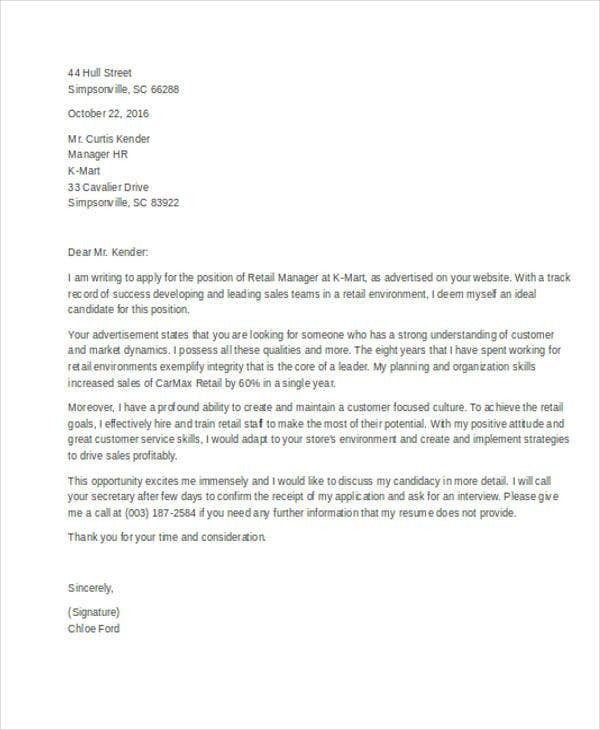 Keep in mind that a cover letter is one way of marketing and promoting yourself in the best way possible. 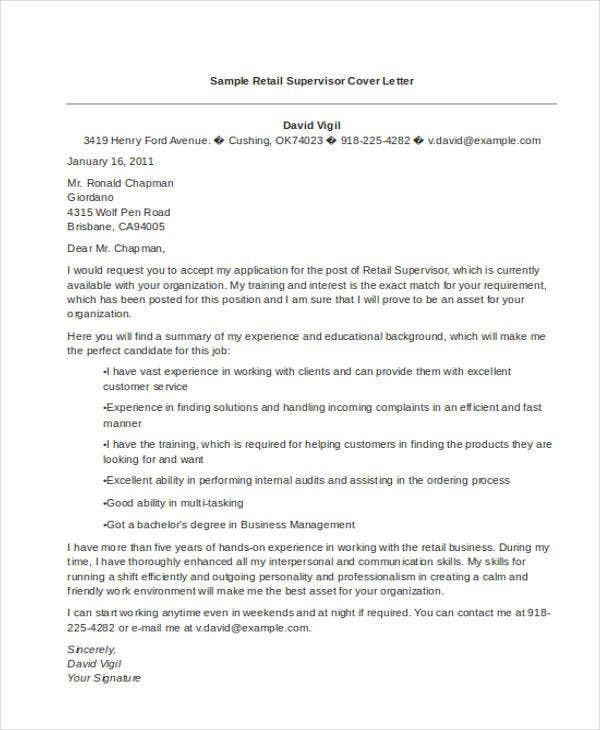 Aside from our retail cover letter templates, we also have a variety of cover letter formats for other industries. Retail managers templates. As a manager, you can actually market your leadership skills and strong track record. You also have to convince and persuade the recruiter that as a manager, you will be objective and customer focused. Retail assistant templates. As what you can see from our template, the applicant can promote his or her qualifications in an orderly manner. Your knowledge about marketing and business communication must also be highlighted. 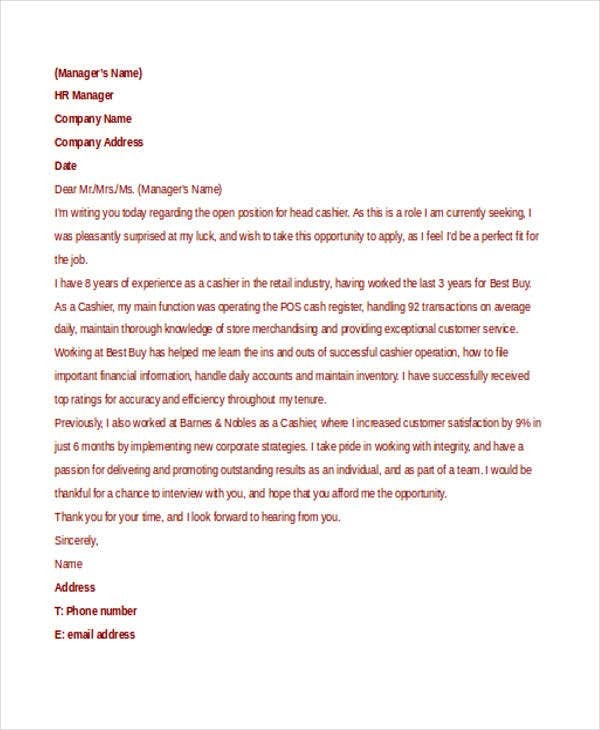 If you want more examples of sales cover letters, we also have a list of Sales Cover Letter Templates that you can easily download and use it as per your requirement. 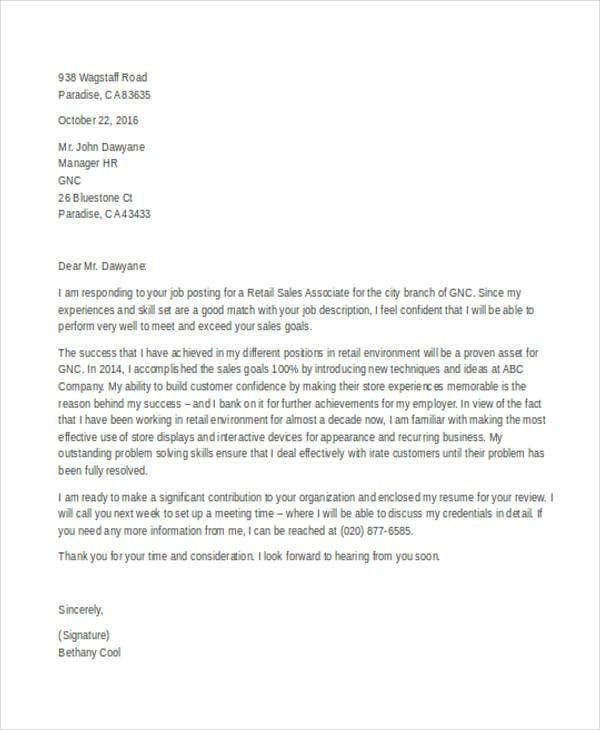 You can also go thourgh some of our featured Cover Letter Templates in Word that you can review to enhance and improve your letters. In breaking down your job cover letter, you have to systematically plan how you will write it. Keeping in mind the formal elements of a cover letter, you should cohesively lay out your explanations. You can divide the body of your letter into three short paragraphs. Each paragraph must have covey an overarching idea. For instance, you can explain the reason why you are writing the cover letter. You have to state your name and the job position you are applying for. You have to express your enthusiasm to be part of the company or organization. For the second paragraph, you have to substantiate why you are fit for the said position. You have to provide proof such as your specific work experiences and academic background. If you have acquired specific certifications and licences, emphasize them. 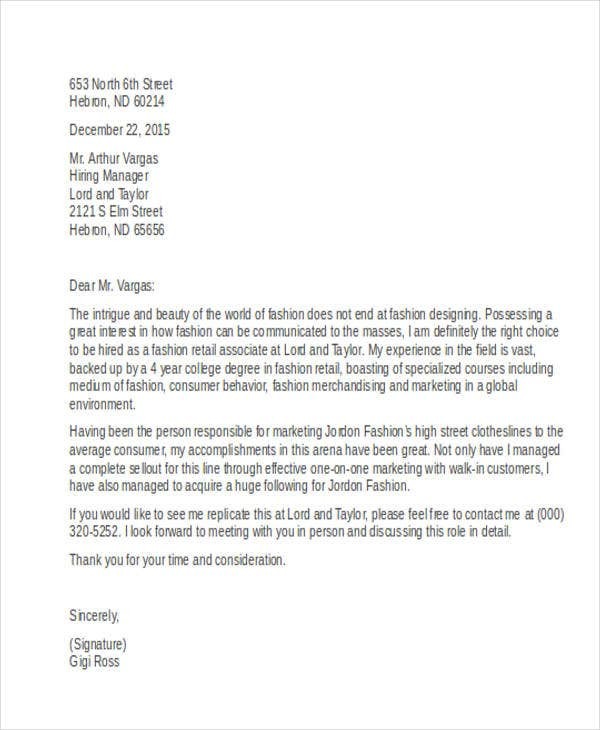 For the last paragraph, you have to conclude your cover letter. You may direct the hiring manager’s attention to the attached documents such as your resume. Don’t forget to convey your words of gratitude for the opportunity and consideration given to you. And lastly, don’t ever forget to include your contact details for them to know how to reach you. These are some points that you may consider. 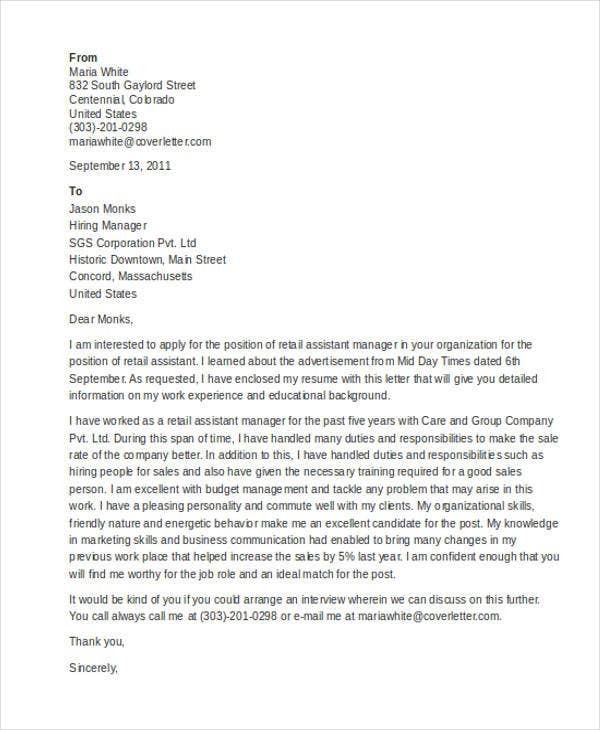 For more Cover Letter Examples, access the provided link to see what they can offer.